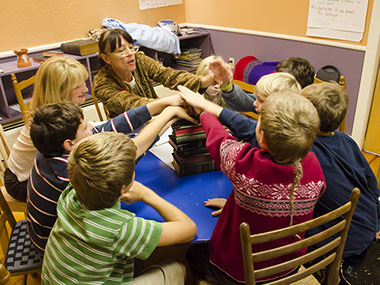 The Religious Education program at the Peterborough Unitarian Universalist Church provides opportunities for all members of our church to deepen their understanding of the principles of UU through educational experiences. For our youngest members, the nursery provides a safe and supportive environment where children can engage in free play while their parents are able to find spiritual enrichment through our worship service. For the rest of our children, the RE program offers age-appropriate experiences that bring together children’s interests with the wisdom and talents of adults, allowing for a rich spiritual exchange that transcends generation. This year we welcomed our new Director of Religious Education, Char James. Having served in the Nursery for a number of years, Char has been able to step into the role with a great deal of knowledge and understanding, both of the systems in place within the church and the families within our community. Throughout the year, our enrollment has included around forty children, although each week actual attendance fluctuates based on the busy lives of our families. The programs within RE have been offered consistently and without interruption, providing the stability that both the church and our young families need. The Spirit Play program employs the wisdom and talents of numerous members of our church community who rotate through as teachers for our 4-7 year olds. The Race to Justice curriculum is offered to our 8-12 year olds, which involved numerous experiences around the Civil Rights Movement and culminated in the students creating their own video game. Our relationship with Otter Brook Farm has continued to deepen, allowing our older students to connect with the land while connecting with each other by working together at the farm on Sunday mornings. Like many churches, we review and seek new approaches as to how best to serve our middle and high school aged youth. Our intergenerational experiences work to build a loving community for all ages of our congregation. One of our strongest traditions is our annual holiday pageant. This year we performed How the Robin got his Red Breast, involving 11 children and a number of adults, both on stage and behind the scenes. The Easter Egg Roll brought children and adults together for some friendly competition and Music Sunday allowed our children to showcase their musical talents for the congregation. We offer the UUA’s sexuality education curricula, OWL (Our Whole Lives) on a regular basis. We open this up to youth outside of our congregation, as well as members of our RE program. The 2015-2016 program reached its enrollment goal of 12 students and is running successfully. The Peterborough Unitarian Universalist Church has been a central part of the town’s landscape and community for nearly two hundred years. For the 275th Anniversary of Peterborough, we offered children’s activities on the front lawn of the church, welcoming children throughout the community. A Magic Show drew a full house of local family members both from and beyond the church community, but its real success came in the opportunity for multiple generations of church members to work together on a single event. This set the stage for potential future programs that could spark the magic that only comes when generations work together within the church. We have adopted the Love Surrounds Us curriculum for the year, which will provide a structure based on the Seven UU Principles, with each month focusing on a different principle. This allows us to specifically reach out to members of the church community who are passionate about different areas of our faith and invite them to share that excitement with the children. The curriculum will aid the delivery by providing the lesson plan options without limiting the creative possibilities of what can happen when generations learn about faith together. We are continuing the programs that have served us well in the past, such as the Otter Brook Farm project, the Pageant, and OWL, while also looking to create additional opportunities such as hiking/geocaching events and programs like the Magic Show where generations of the Peterborough Unitarian Universalist Church can play together, learn together, serve together, and strengthen our community.